There are some traditions of modern Paganism that follow the structure of the ancient Egyptian religion. Typically these traditions, sometimes referred to as Kemetic Paganism or Kemetic reconstruction, follow basic principles of Egyptian spirituality such as honoring the Neteru, or deities, and finding a balance between man's needs and the natural world. Like many ancient cultures, such as the Greeks or Romans, the Egyptians incorporated religious beliefs into their daily lives, rather than keeping them separate. A reconstructionist, or recon, tradition is one based upon actual historical writings and attempts to literally reconstruct the practice of a specific culture. Richard Reidy at The Kemetic Temple says there are a lot of misconceptions about what Kemeticism actually is. "I do not speak for all Reconstructionists, but all the Recon temples I am familiar with use the ancient texts as guides, not as rigid, unalterable models... [We] are fully aware that we are citizens of the twenty-first century, coming from cultures very different from that of ancient Egypt. It is not our goal to abandon our way of thinking for some imagined ancient way of thinking. Such a feat is neither possible nor desirable. We do know, however, from our personal and group experiences that the gods transcend the limits of any particular time or place... [There is a] clear implication was that Reconstructionists are so preoccupied with scholarly research that we neglect or devalue the personal encounter with the gods. Nothing is further from the truth." For members of most Kemetic groups, information is gained by studying scholarly sources of information on ancient Egypt, and working directly with the gods themselves. There are a number of smaller subgroups within the Kemetic framework. These include -- but are certainly not limited to -- the Ausar Auset Society, Kemetic Orthodoxy, and Akhet Het Heru. In these traditions, there is an acknowledgement that each person has their own individual interactions with the Divine. However, these experiences are also measured against historical and scholarly sources, to help avoid the trap of unverifiable personal gnosis. 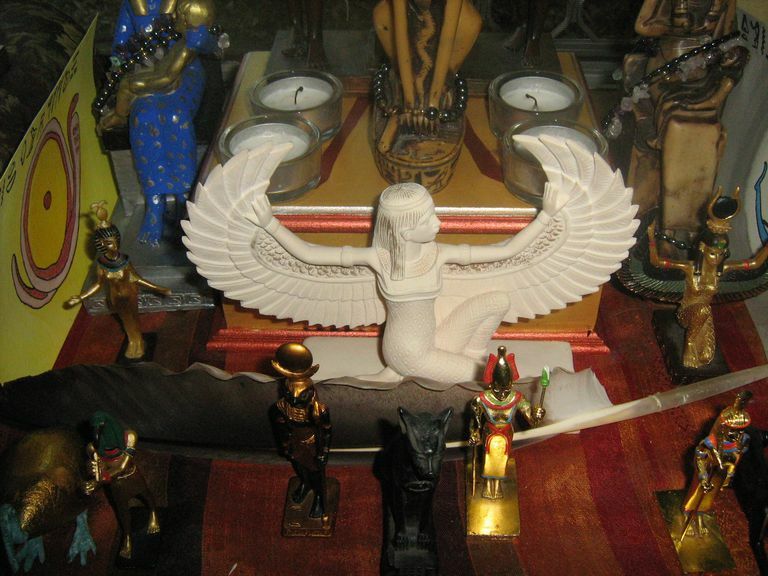 Devo at The Twisted Rope offers some tips on getting started in Kemetic studies, and recommends the basics of interacting with the gods and other Kemetics, and reading as much as possible. "If you want to get to know the gods better, reach out to them. Sit with them, give them offerings, light a candle in their honor, do an activity in their name. Something. Anything. And it doesn’t have to be a specific god. Trying to establish a connection is what matters." In addition to the Kemetic reconstruction movements, there are also many groups that follow Egyptian gods within a Neopagan framework, utilizing the northern European Wheel of the Year and Wiccan sabbat dates. Turah lives in Wyoming, and honors the Egyptian gods within a Neopagan structure. She marks the traditional eight sabbats, but incorporates the Egyptian deities into that system. "I know a lot of the recon people frown upon this, which is why I practice alone, but it works for me. I honor Isis and Osiris and the other gods of the Egyptian pantheon as the seasons change, and based upon agricultural makers. I'm not trying to fit square pegs into round holes or anything, but the more I practice and interact with my gods, the more I realize that they don't seem to mind how I honor them, but more that I just do."